Get down and dirty with the Xerces SAX parser. In the first part of this article, I introduced you to the Xerces XML parser, explaining how it could be used to parse XML documents using an event-driven approach called SAX. I also demonstrated how the parser worked by using it in a couple of simple Java programs, and explained some of the interfaces and callbacks available in the API. Now, writing a Java program to parse an XML document is all well and good. However, it's not really all that useful if you're a Web developer and your primary goal is the dynamic generation of Web pages from an XML file. And so, this concluding part takes everything you learned last time and tosses it out into the wild and wacky world of the Web, demonstrating clearly how Java, JSP, Xerces and XML can be combined to create simple, real-world Web applications. Take a look! As in the first part of this article, we'll begin with something simple. Remember that event trail you saw in one of the very first examples? This next example ports that code to work with a Web server. I don't want to get into the details of the callbacks here - refer to the explanation for the original example if there's something that doesn't seem to make sense - but I will point out some items of interest. The most important difference between this example and the previous one is the introduction of a new Writer object, which makes it possible to stream output to the browser instead of the standard output device. Once this class has been compiled, it can easily be imported and used in a JSP document, thereby immediately making the application Web-friendly. As you can see, the callback functions used here have evolved substantially from the previous examples - they now contain more conditional tests, and better error handling capabilities. Let's take a closer look. Most of the work in this script is done by the startElement() callback function. This function prints specific HTML output depending on the element encountered by the parser. This function maps different XML elements to appropriate HTML markup. 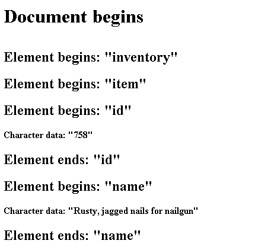 As you can see, the document element "inventory", which marks the start of the XML document, is used to create the skeleton and first row of an HTML table, while the different "item" elements correspond to rows within this table. 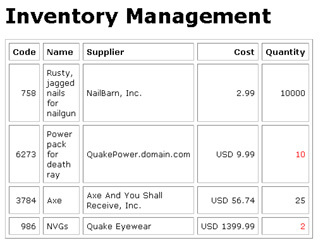 The details of each item - name, supplier, quantity et al - are formatted as cells within each row of the table. Next, the characters() callback function handles formatting of the content embedded within the elements. For most of the elements, I'm simply displaying the content as is. The only deviation from this standard policy occurs with the "quantity" element, which has an additional "alert" attribute. This "alert" attribute specifies the minimum number of units that should be in stock of the corresponding item; if the quantity drops below this minimum level, an alert should be generated. Consequently, the characters() callback includes some code to test the current quantity against the minimum quantity, and highlight the data in red if the test fails. And finally, to wrap things up, the endElement() callback closes the HTML tags opened earlier. If you take a close look at the previous example, you'll notice some fairly complex error-handling built into it. It's instructive to examine that, and understand the reason for its inclusion. By default, the startElement() callback is not set up to throw any exception. However, it's possible to alter this default behaviour and set it up to throw a SAXException if an error occurs with the Writer object, and propagate this error to the target JSP document. How about another example, this one utilizing a different technique to format XML into HTML? 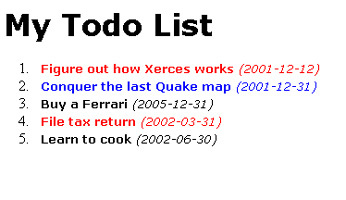 Here's the XML file I plan to use - it's a simple to-do list, with tasks, priorities and due dates marked up in XML. This is much cleaner and easier to read than the previous example, since it uses Java's HashMap object to store key-value pairs mapping HTML markup to XML markup. Three HashMaps have been used here: StartElementHTML, which stores the HTML tags for opening XML elements; EndElementHTML, which stores the HTML tags for closing XML elements; and PriorityHTML, which stores the HTML tags for the "priority" elements defined for each "item". A string variable named ElementName is also used to store the name of the element currently being parsed; this is used within the characters() callback function. Now, when an opening tag is found, the startElement() callback is triggered; this callback function uses the current element name as a key into the HashMap previously defined, retrieves the corresponding HTML markup for that element, and prints it. Note the numerous checks to avoid NullPointerExceptions, the bane of every Java programmer on the planet. With the opening element handled, the next step is to process the character data that follows it. This is handled by the characters() callback, which performs the important task of displaying the element content, with appropriate modification to the font colour depending on the element priority. Here, the priority of the task is used to retrieve the corresponding display colour for from the PriorityHTML HashMap, and the content is then printed in that colour. Finally, the endElement() callback function replicates the functionality of the startElement() callback, closing the HTML tags opened earlier. Because I've used HashMaps to map XML elements to HTML markup, the code in the example above is cleaner and easier to maintain. Further, this approach makes it simpler to edit the XML-to-HTML mapping; if I need to add a new element to the source XML document, I need only update the HashMaps in my class code, with minimal modification to the callbacks themselves. That's about it for this article. Over the preceding pages, you learned more than you ever wanted to know about the Xerces SAX parser, using it to develop simple XML-based applications in both Web and non-Web environments. You (hopefully) understood how SAX works, gained an insight into what callback functions do, and learned how to use Xerces' interfaces in combination with simple Java constructs to quickly and easily create dynamic Web pages from static XML documents.